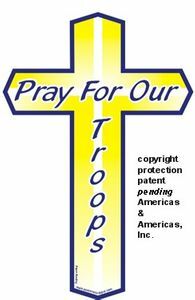 Home > Magnets, Flags and Decals > Cross/Crucifix > Pray For Our Troops Cross Magnets Large 4"x6"
Pray For Our Troops Cross Magnets Large 4"x6"
This large yellow cross is a great way to show your support for our troops! Features the words "Pray for our Troops" in black on a yellow cross symbolizing those who are away in the military. Camouflage Cross Magnet Large 4"x6"
God Bless the USA Cross Magnet 4"x6"
Got Jesus Cross Magnets 4"x6"